7.10 points at 10 votes (rank 329). The events take place in a far away galaxy which consists of 36 worlds. Each of the maximum possible 4 players has a world. The aim is the conquest of the whole galaxy, but you are also the winner if you have defeated all opponents or you simply limit the number of rounds. Each world produces spaceships. To attack hostile worlds, you send these ships on their way to the opponent. An important factor in this game is the "travel time". Because up to 6 moves can pass until the ships arrive, depending on the distance. With the same principle ships can also be sent to own worlds to be able to defend yourself. But you should also beware of the native mutations; they have their own ships and appear randomly. You cannot see on which worlds they are. There are two versions: classic and advanced. In the Classic version the computer opponent "Deep Jones" can join. As soon as all game settings have been done at the beginning, it’s the players’ turn one after the other, whereby fate decides each time who is first. Each player has only a limited number of orders available. So you should think wisely, if you want to send your armada to planet A now or rather call for some backup from planet B first. In the Advanced mode the single planets do not only produce stupefyingly new star cruisers. Instead the player takes over the rather complex resource management that was previously done by the computer. So the workers only produce enough offspring under good working and living conditions. If this fails there will be no more ships soon. You have an analogue problem, if all resources on the planet are used up. Research and development – if used correctly - can optimize all factors and e.g. raise the resource yield. The whole management is so complex that the computer opponent Deep Jones cannot join in this mode. So the player can only play alone or find a few friends with enough time for the now considerably more time consuming game sessions. Only when all players have placed their orders, the game calculates the corresponding effects and shows them on the start map. This round-based procedure has unfortunately sunk a bit into oblivion in course of the real time strategy games. In the game one game round is a year. It takes about 30 – 50 years until the game brings out a clear winner. But the current game status can be saved on disk any time. After every move some data is written into the so-called log file. This offers a statistic overview of the course of the game and can be viewed with the log file viewer. 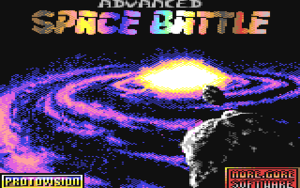 Graphics: One of the two fundamental changes towards Space Battle Deluxe is an additional, graphic star map. On it, all started actions are presented in an animation. With this tool the flying direction of the hostile ships and their approx. strength can be recognized and followed. On the rather sparse overview screen this information is completely missing. Sound: One phenomenal hour of choice SID music, individually selectable in the Big Menu, await the player as atmospheric background accompaniment of the game. Some pieces are more warlike-adrenalin-producing, others pick up known Science Fiction themes more relaxingly. For each mood should be something there, if a tune has looped too often you can just pick the next. The controls are done by mouse in port 1 or joystick in port 2 or keyboard (cursor keys + Return). The window-based surface is self-explanatory. After the start you can choose if you want to play a "Classic-" or "Advanced match" or continue a saved game. Then you can set the number of years (for beginners 30 should be ideal) and the action limit (number of orders) (7 is adequate at the beginning). After that you enter a name for the log file, which is then written on an own disk and contains the statistics which can be viewed with the "log file-viewer" as line diagram. If no log file is wanted, simply press "Return". Now follows the selection of how the 36 worlds are shared on the map. Random galaxies: Make interesting matches, but Deep Jones is a bit harder to defeat. Circular galaxies: are more balanced. Better for beginners. Square galaxies: concentration of the worlds in all corners of the map. The players lead the fight in the middle. Deep Jones loves such matches. Weird galaxies: can lead to a very unfair game if you do not agree on symmetrical starting positions beforehand. The features of the worlds and their production are totally independent from the chosen galaxy type. Lastly the start worlds are chosen. 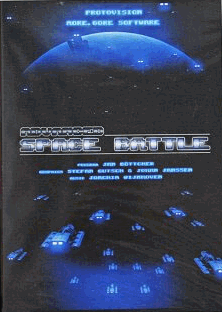 In this version the rules are almost the same as in the PD game "Space Battle deluxe V2.3"
In each move fate decides which player is first. The first screen is the tactical overview map. At the right a window with numbers and letters is shown, e.g. G 1 10 100. G = starting world, 1 = player number, 10 = units ship industry, 100 = ships ready for action. A click on galaxy leads to the galaxy view; here the worlds are displayed graphically. To send ships, first click on the starting worlds, then on the target world, then adjust the number of ships. End the move with the end-turn. If all players have finished their move, the ships start to move. Before the next year (move) begins, random events can happen. In the galaxy there are also natives, which also produce ships but normally do not send them out. But sometimes mutations happen and they get aggressive. Natives can also win a game. Additionally "Deep Jones" gets into the act. It always joins in the singe player mode, in the multiplayer matches it is an additional option. As it is a bit simple-minded, he was admitted a few advantages as more ships at the start, no limit of actions. It basically follows the rules of the classic version but has some comprehensive expansion. Unfortunately, "Deep Jones" cannot take part. Most of these expansions can be found in the management screen which is called up by a click on a world in the galaxy view and choosing "Manage". Resources, Enviroment and Population: These three parameters are basic. Environment shows how good the living conditions are on this world (atmosphere, climate, temperature). Much industry can worsen this, however. Population is needed as manpower. For a growing population two factors are responsible: birth rate (Fertility) and death rate (Mortality). General Industry is the main pillar and is needed to pay everything else. A unit should produce 6-10 units of capital per year. The less resources, the less capital. The fewer workers, the less working factories. The more output the factories produce, the richer are the inhabitants, but the less is the population growth (no time for children). The Ship Industry produces one ship per unit and year. But the environment is harmed by them. In contrast to the classic version, ships have here different technical levels. Research and Development divisions of all worlds orient at the given research aim which allows modernisation when reached. Services do not seem to be that important at first sight, but as they also comprise the medical treatment and further basic needs of the population, the mortality depends on them. Defendence Bases serve the protection of the world against hostile attacks. But if the mortality of the population rises into the direction of the maximum value (300), rebels will try to take it over. If no bases are left any more, the "Natives" take over this world. In each of the ten modernisation areas you start with level 0, by paying the corresponding capital you get to 1. By research in the corresponding area the level can be raised to 15. For each area there are three research fields (levels 5, 10, 15). You need to modernise on each world separately, for this the world needs the capital of course. Resource Care effects that the industry can use resources more effectively and that they last longer. Belonging research projects are Resource Monitoring, Recycling, Renewable Resources. Mining allows a higher industrial output despite less resources (Advanced Mining I + II, Synthetic Resources). Communication provides for a fast exchange of information between the worlds and that ships can be called back during an unwinnable fight (Retreat, Intelligent Retreat, Battle Control). The starting world should lie in an area with many grey "Native Worlds". You can conquer them right at the beginning. Keep a safe distance to your opponents so they cannot hinder your growth with early conflicts. Avoid the middle of the galaxy, as otherwise you can be quickly surrounded from all sides. Try to avoid worlds that lie between two opponents. H.T.W: "Advanced Space Battle is a game, that players who like to play this genre can fascinate for a long time, as it is not too simple and you have to occupy yourself with it for some time. The music pieces and the thought-through gameplay stand out positively. The packing and the manual (about 100 pages, high gloss cover, manuals in English and German), represent a collector’s item and are professional (they even thought of an empty diskette for the scores!!). A game that is surely worth its price, it leaves behind the German classic „Sterne wie Staub“ concerning the complexity. The “Advanced version“ offers very many possibilities to influence the course of the game itself and is by this strongly superior to the Classic version, as there you are faced with the more or less random events and a rather strong Deep Jones. The only negative point is, that the end offers only a static overview of who built how many ships, it would have been nice to have one or better more final animations, depending on whether Deep Jones or the player or the natives have won at the end. Despite the small defects, this simulation has found its place next to Gunship, Pirates and Giana Sisters in my "Best-of-shelve"...". TheRyk: "All in all a great game, close to perfection. The Deep-Jones-AI is only a sparring partner for real strategists. The mutants / natives need to be taken more seriously though, especially if you hang around idly for too long. Otherwise, the Classic version is a nicely done spiced up version of the board game Risk. The interesting factor is the delayed arrival of the sent out fleets and the moving universe resulting in changing distances. The Advanced version is quite time-consuming due to the game's complexity and does only make sense in multiplayer mode. Even a 20 round game in pairs with an action limit of 7 can easily take an afternoon or evening due to micro management, maybe it's a good candidate for VICE Netplay. The menu navigation could be clearer; you easily waste one of the scarce orders if you are too lazy to search for important information laboriously in the overview or even in the "Big Menu". But all in all, it is a worthwhile investment for small money. The music contributes to the Space Battle atmosphere very well. If you take some time, you will discover new facettes again and again, e.g. in the Advanced version when caring for your single worlds. Great game, 8 points!" The game has no copy protection, but in return an Ingame-Protection which should generally aggravate changes in the programme code, especially intro links. This has the effect that a crack cannot work 100% (changes in the course of the game). Total number of ships - Number of ships that were produced in the last six years + number of worlds x 50.